Last Thursday, I went to Ana’s school for Muffins for Mom. There were a lot of other mothers there, and once we settled into the classroom and sat down at the little tables, the similarities between mommies and children were uncanny. Without exception (at least in this classroom on this day), personalities were matched up with similar personalities, mannerisms with similar mannerisms. The outgoing, social mommies had the most social, outgoing children. The quiet, reserved mommies had the quiet, reserved children. Mannerisms were mirrored, from the way they held their teacups and ate their muffins to the way they listened to the teacher to the way they talked with those around them. My own wee one even sat in her chair in the exact same position I sat in mine, with little legs crossed at the ankles and hands tucked in her lap. It hadn’t struck me until then how closely our children watch us and how much of an impact that makes on the way they live. Sure, things like looks and mannerisms and even, to some extent, personalities are more nature than nurture, but how a child lives can be a reflection of their parents. I can see it in myself, how so much of what I think and believe is because of my parents and how much I, even as an adult, live just like they did because… well, the way they did everything was the right way to do it, right?! We are, for our children, an example of how to live. We’re models of right and wrong, teachers without even necessarily wanting to be, a standard by which they measure the world around them. How we live our lives instructs our children in the ways that they should walk, for better or worse. Once we were back at the house, she was so proud of her quarter of a mile run. There were high fives all around, and Ana told me, “I ran just like you!” She was gleeful for the rest of the night. I’m reminded that there are two little people who are always watching me. And for better or worse, I’m an example to them. From running to being a wife, to spending my free time to getting goals accomplished — they’re learning how to live life by watching Mommy. I’m so challenged to be the kind of person I want my girls to be. To love God more, to serve my family better, to admit my failures, to show grace and compassion to others, and to live for more than just the here and now. When they’re young ladies, I want them to be the kind of women who love and serve God, who spend their time and energy in ways that really matter, and who find all of their security in Christ alone. If they’re ever going to be THAT kind of woman, though, Mommy has to be her first. I obviously have a long, long way to go. So glad that this process is not a sprint but a long, long, LONG distance run. 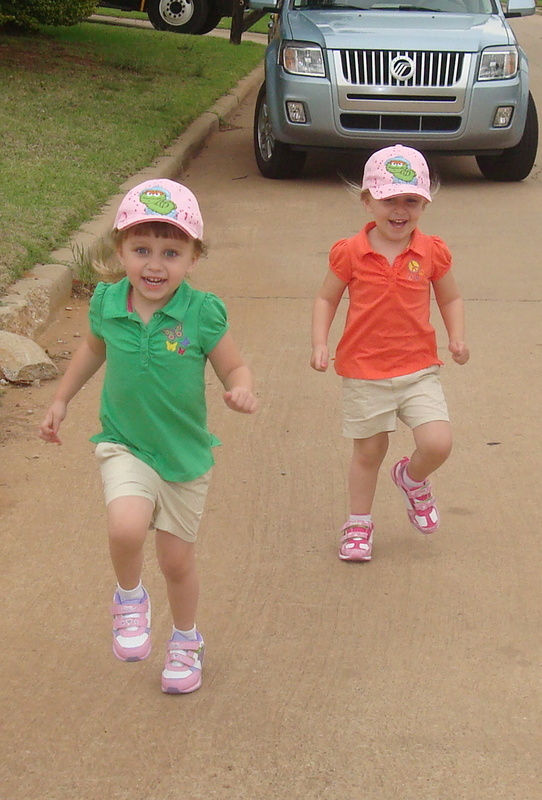 And I’m so thankful for the two girls running right with me. What a sweet post, and a precious reminder! !